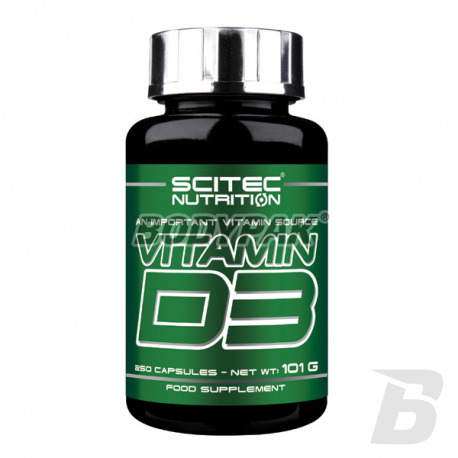 Vitamins & MineralsScitec Vitamin D-3 250 kaps. 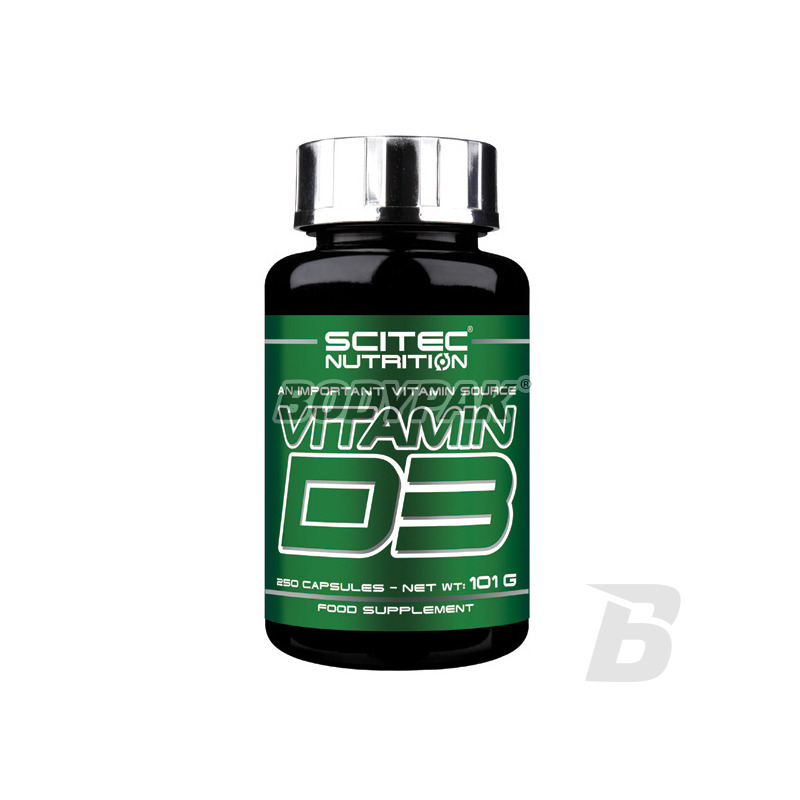 Scitec Vitamin D-3 250 kaps. Vitamin D-3 has a beneficial effect on the skin, reduces inflammation, regulates blood sugar levels by secreting insulin. Vitamin D-3 - stimulates the absorption of calcium and phosphorus and their excessive excretion of urine thus has a significant impact not only on the proper development of bones in children and adults and their appropriate density but also on the state of our teeth. In the case when the body can not get enough calcium from food to take it from the bones. The presence of vitamins in the body has a beneficial effect on the nervous system and muscle spasms, eg. Heart. By contrast, the optimum amount of calcium has a beneficial effect on nerve impulses. Vitamin D has a beneficial effect on the skin, reduces inflammation, regulates blood sugar levels by secreting insulin. Składniki: Substancja wypełniająca (Celuloza mikrokrystaliczna), żelatyna wołowa, cholekalcyferol, substancja przeciwzbrylająca (Stearynian magnezu), barwnik (Dwutlenek tytanu). Jeden z podstawowych suplementów, który dobrze byłoby stosować codziennie. Suplement warty polecenia, tani z odpowiednim składem. Dobry suplement w rozsądnej cenie. Stosuje szczególnie w okresie zimowym i zauważyłam poprawę samopoczucia i w moim przypadku poprawa stanu cery.